If you are an outdoors lover then Appalachian Outdoors, online at AppOutdoors.com, is the perfect store for you. App Outdoors offers huge selection of men's and women's apparel, equipment, and accessories for the great outdoors. App Outdoors offers items for snowboarding and skiing, climbing, biking, hiking, camping, as well as travel and fitness equipment. App Outdoors offers outdoor products from the greatest, most popular brands. Among these brands are Patagonia, the Northface, Life is Good, Prana, Mountain Hardwear, and many more. Find all the outdoor supplies and apparel you need all at Appalachian Outdoors. Remember to first check out RetailSteal for the best App Outdoors promotions, App Outdoors coupon codes, and App Outdoors discounts. 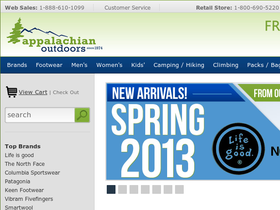 Appalachian Outdoors currently only ships to the US and Canada. Orders are generally shipped via UPS and take about 3-5 business days. See website for full details, exclusions may apply. Act now and enjoy a $10 discount on your order of $75+ with this coupon code from Appalachian Outdoors. Save up to 75% on items in the clearance section at AppOutdoors. At AppOutdoors, enjoy free ground shipping on orders of $49+. Check out AppOutdoors online for their latest special offers. Shop the winter clearance online at AppOutdoors.com and save between 30-40% on products from North Face, Patagonia, Life is Good, Mountain Hardwear, and more. Click here to shop. Save $20 off your order of $100+ with this coupon code from Christy Sports. Act now and save $50 off your order of $200+ with this coupon code from Christy Sports. Check out Christy Sports online for their latest special offers and coupon codes.